The Velveteen Rabbit starts out on Christmas morning. A young boy finds a stuffed rabbit nestled in his stocking. He loves the rabbit but forgets about him when more glamorous and expensive Christmas presents arrive. But chance will intervene twice in this magical story about childhood toys and the transformative power of love. We feature it in Christmas Stories for Children. "It doesn't happen all at once," said the Skin Horse. "You become. It takes a long time. That's why it doesn't often happen to people who break easily, or have sharp edges, or who have to be carefully kept. Generally, by the time you are Real, most of your hair has been loved off and your eyes drop out and you get loose in the joints and very shabby. But these things don't matter at all, because once you are Real you can't be ugly, except to people who don't understand." 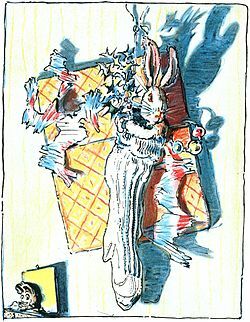 That night, and for many nights after, the Velveteen Rabbit slept in the Boy’s bed. At first he found it rather uncomfortable, for the Boy hugged him very tight, and sometimes he rolled over on him, and sometimes he pushed him so far under the pillow that the Rabbit could scarcely breathe. And he missed, too, those long moonlight hours in the nursery, when all the house was silent, and his talks with the Skin Horse. 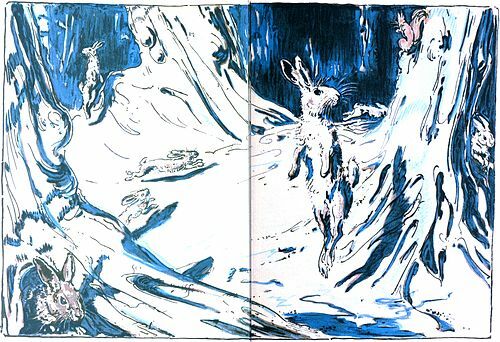 But very soon he grew to like it, for the Boy used to talk to him, and made nice tunnels for him under the bedclothes that he said were like the burrows the real rabbits lived in. And they had splendid games together, in whispers, when Nana had gone away to her supper and left the nightlight burning on the mantelpiece. And when the Boy dropped off to sleep, the Rabbit would snuggle down close under his little warm chin and dream, with the Boy's hands clasped close round him all night long. And so time went on, and the little Rabbit was very happy—so happy that he never noticed how his beautiful velveteen fur was getting shabbier and shabbier, and his tail coming unsewn, and all the pink rubbed off his nose where the Boy had kissed him. "Give me my Bunny!" he said. "You mustn't say that. He isn’t a toy. He’s REAL!" "Ho!" said the furry rabbit. "It's as easy as anything." And he gave a big hop sideways and stood on his hind legs. "He doesn’t smell right!" he exclaimed. "He isn’t a rabbit at all! He isn’t real!" "I am Real!" said the little Rabbit, "I am Real! The Boy said so!" And he nearly began to cry. "Come back and play with me!" called the little Rabbit. "Oh, do came back! I know I am Real!" "Oh, dear!" he thought. "Why did they run away like that? Why couldn't they stop and talk to me?" For a long time he lay very still, watching the bracken, and hoping that they would come back. But they never returned, and presently the sun sank lower and the little white moths fluttered out, and the Boy came and carried him home. 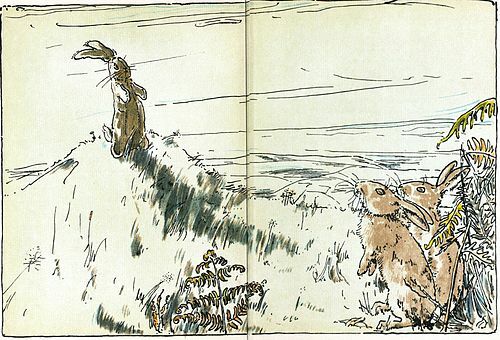 Weeks passed, and the little Rabbit grew very old and shabby, but the Boy loved him just as much. He loved him so hard that he loved all his whiskers off, and the pink lining to his ears turned grey, and his brown spots faded. He even began to lose his shape, and he scarcely looked like a rabbit any more, except to the Boy. 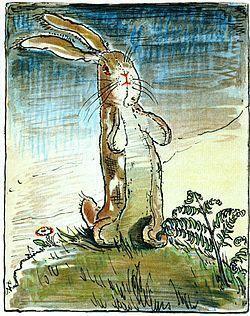 To him he was always beautiful, and that was all that the little Rabbit cared about. He didn’t mind how he looked to other people, because the nursery magic had made him Real, and when you are Real shabbiness doesn't matter. His face grew very flushed, and he talked in his sleep, and his little body was so hot that it burned the Rabbit when he held him close. 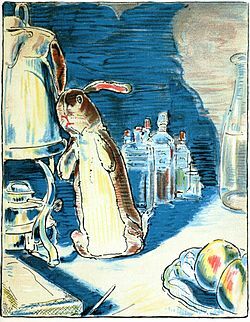 Strange people came and went in the nursery, and a light burned all night, and through it all the little Velveteen Rabbit lay there, hidden from sight under the bedclothes, and he never stirred, for he was afraid that if they found him some one might take him away, and he knew that the Boy needed him. It was a long weary time, for the Boy was too ill to play, and the little Rabbit found it rather dull with nothing to do all day long. But he snuggled down patiently, and looked forward to the time when the Boy should be well again, and they would go out in the garden amongst the flowers and the butterflies and play splendid games in the raspberry thicket like they used to. All sorts of delightful things he planned, and while the Boy lay half asleep he crept up close to the pillow and whispered them in his ear. And presently the fever turned, and the Boy got better. He was able to sit up in bed and look at picture books, while the little Rabbit cuddled close at his side. And one day, they let him get up and dress. "That?" said the doctor. "Why, it’s a mass of scarlet fever germs!—Burn it at once. What? Nonsense! Get him a new one. He mustn’t have that any more!" And while the Boy was asleep, dreaming of the seaside, the little Rabbit lay among the old picture-books in the corner behind the fowlhouse, and he felt very lonely. The sack had been left untied, and so by wriggling a bit he was able to get his head through the opening and look out. He was shivering a little, for he had always been used to sleeping in a proper bed, and by this time his coat had worn so thin and threadbare from hugging that it was no longer any protection to him. Near by he could see the thicket of raspberry canes, growing tall and close like a tropical jungle, in whose shadow he had played with the Boy on bygone mornings. He thought of those long sunlit hours in the garden—how happy they were—and a great sadness came over him. He seemed to see them all pass before him, each more beautiful than the other, the fairy huts in the flower-bed, the quiet evenings in the wood when he lay in the bracken and the little ants ran over his paws; the wonderful day when he first knew that he was Real. He thought of the Skin Horse, so wise and gentle, and all that he had told him. Of what use was it to be loved and lose one’s beauty and become Real if it all ended like this? And a tear, a real tear, trickled down his little shabby velvet nose and fell to the ground. She was quite the loveliest fairy in the whole world. Her dress was of pearl and dewdrops, and there were flowers round her neck and in her hair, and her face was like the most perfect flower of all. And she came close to the little Rabbit and gathered him up in her arms and kissed him on his velveteen nose that was all damp from crying. "I’ve brought you a new playfellow," the Fairy said. "You must be very kind to him and teach him all he needs to know in Rabbitland, for he is going to live with you for ever and ever!" But the little Rabbit sat quite still for a moment and never moved. For when he saw all the wild rabbits dancing around him he suddenly remembered about his hind legs, and he didn’t want them to see that he was made all in one piece. 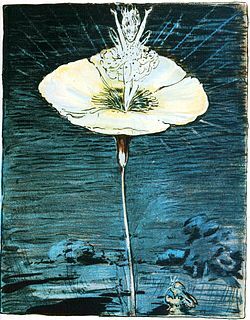 He did not know that when the Fairy kissed him that last time she had changed him altogether. And he might have sat there a long time, too shy to move, if just then something hadn't tickled his nose, and before he thought what he was doing he lifted his hind toe to scratch it. You and your children may also enjoy reading Aleksandr Kuprin's story about a sick child's comfort from an animal who becomes "real": The Elephant. And be sure to visit our Children's Stories and Christmas Stories. 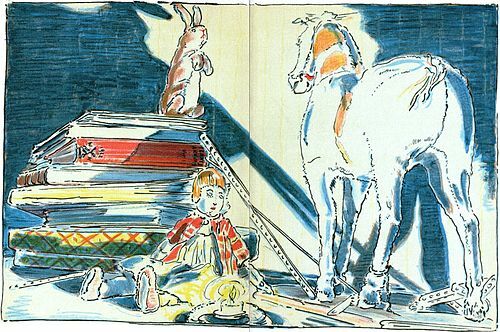 Add The Velveteen Rabbit to your own personal library.